Balto & Togo: Goodbye Nome! The 1925 Serum Run was an extraordinary and heroic effort by twenty mushers and their sled dog teams, working in a relay system, to deliver diphtheria antitoxin to the disease-stricken town of Nome, Alaska. The nationwide news coverage of the battle by men and dogs against the elements and time led to subsequent nationwide tours by two of the teams. After leaving for their respective tours in the lower 48 states, the two famous lead dogs -- Balto and Togo -- never returned to the place where both were born and raised -- the town that they had worked so hard to save. Here are the stories of the first leg of the two tours -- for Gunnar Kaasen and Leonhard Seppala -- and some details about the fates of both mushers and their lead dogs. 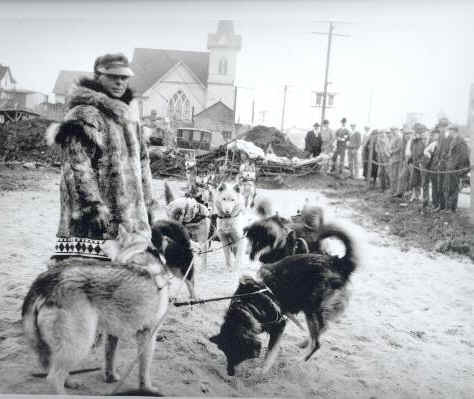 Gunnar Kaasen and his dog team, led by Balto, was the last team of the Serum Run relay in the race to Nome. They arrived on February 2, 1925, and delivered the antitoxin to Dr. Curtis Welch. Much of the news coverage of this event was focused on the arrival of the life-saving serum. As a result, Balto became an instant celebrity. Not long after the Serum Run, Sol Lesser sent a telegram to Gunnar Kaasen offering him a movie deal. Sol Lesser was an early pioneer in the motion picture industry. In 1921, he had formed his own production company, the Principal Pictures Corporation. 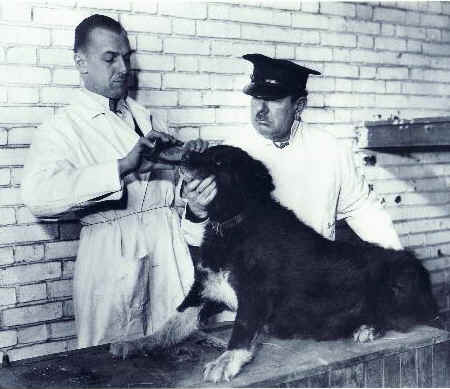 One of the provisions of the offer was that Kaasen had to bring all of the dogs he had used in the Serum Run to the location where the movie was to be filmed. In the event he was unable to do so, then the deal was off. The movie was scheduled to be filmed at Mt. Rainier National Park in Washington State. Gunnar Kaasen and his sled dog team arrived at Seattle, Washington, on March 21, 1925 aboard the Alaska Steamship Company vessel, Alameda. After receiving a hero's welcome from the citizens of Seattle, Kaasen and the dogs set off for Mt. Rainier National Park. The park's superintendent had granted a special use permit to Principal Pictures for the filming of the movie during the period March 20 - 28, 1925. The movie was filmed at the Paradise Valley area of the park and was titled "Balto's Race to Nome." The movie purported to be a reenactment of the Serum Run and was later released to nationwide audiences. In December of 1926, Gunnar Kaasen parted company with the nine remaining dogs of his tour team in Chicago, Illinois. The dogs were subsequently sold to a person with a history of animal abuse. The names and fates of two of these dogs are unknown. Seven dogs survived the ordeal of being put on display at a sleazy dime museum in Los Angeles, California, where they were subjected to deplorable conditions. After being rescued by the citizens of Cleveland, Ohio in March of 1927, these seven dogs -- Balto, Alaska Slim, Fox, Billy, Sye, Old Moctoc and Tillie -- spent the rest of their lives with dignity at the old Brookside Zoo, now the Cleveland Metroparks Zoo. This photo of Balto near the end of his life was taken in 1933 at the Brookside Zoo. Balto is being examined by Dr. W. T. Brinker. The man wearing the hat is Captain Curly Wilson, who was Balto's keeper at the zoo. 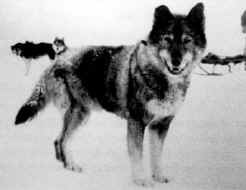 Balto was near death when he was put to sleep by Dr. R. R. Powell on March 14, 1933. Balto was preserved; his mount is on display at the Cleveland Museum of Natural History. After the death of Balto, only Sye was left. He died in 1934 at the age of seventeen. Sye was also preserved by a taxidermy company in Cleveland. The fate of Sye's mount is unknown. 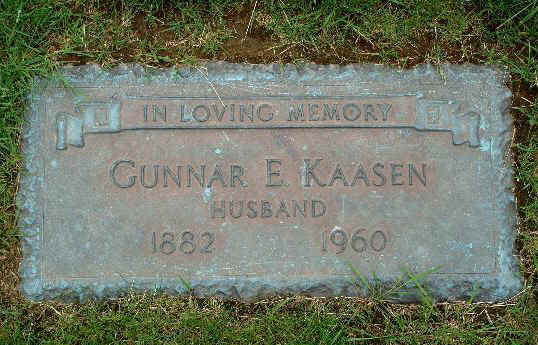 Gunnar Kaasen and his wife retired to Everett, Washington in the early 1950's. He died of cancer on November 27, 1960, and is buried next to his wife, Anna, at the Cypress Lawn Memorial Park cemetery in Everett. Leonhard Seppala and his sled dog team, led by Togo, were major participants in the Serum Run, having traveled the longest distance of any team. Seppala and his dogs also traveled from Alaska to the lower 48 states to do a nationwide tour. They arrived at Seattle on November 2, 1926 aboard the Alaska Steamship Company freighter, Tanana. There were conflicting reports at the time as to the number of dogs on board the Tanana. 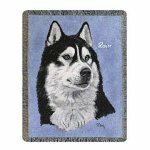 One account stated there were 52 Alaskan Malamute dogs and 150 live reindeer. Twelve of the dogs were to be taken to Hollywood, California, by Merle Lavoy, a motion picture photographer, and Arthur Keogh of Nenana, Alaska, to appear in a film. The other 40 dogs were to participate in various races in the eastern United States and Canada. The article further reports that both Seppala and Lavoy accompanied the dogs during their journey from Alaska. In response to a request to take a picture of Togo, Leonhard Seppala is quoted as saying, "He's getting old, and he's dirty and ragged from the long trip. I'd like to brush him up before you take his picture." The decision was made to include another veteran dog of the Serum Run in that photo -- the beautiful co-leader of the team, Fritz. Museum of History & Industry, Seattle. In addition to the news media, the Tanana was met by a large party of "old-time Northerners" including Ralph Lomen and W. C. McGuire. Lomen was from the Lomen Brothers Company in Nome and had provided some of the reindeer on board the ship. McGuire was the former head of the Nome Kennel Club. Another account of the arrival of the Seppala team, which includes the photo taken aboard the Tanana, stated that Leonhard Seppala had 42 dogs and three sleds with him. There was no mention of the reindeer, Merle Lavoy or Arthur Keogh. Upon his arrival at Seattle, Leonhard Seppala learned that the agents who were going to pay his expenses for the nationwide tour had gone out of business, according to reports at the time. He and his dogs were taken in by the local Norwegian community. The dogs were put up in a horse barn. An agent approached Leonhard Seppala with an offer of $1,500 if he would do an eight-day tour in Bellingham, Washington, one account says. Seppala and a reported "twenty huskies" did in fact travel to Bellingham, a city north of Seattle, for a one-week tour. They arrived by train on the evening of November 5, 1926. The tour started the next morning. The local newspaper reported that Leonhard Seppala had 20 dogs with him, but other news accounts reported 22 dogs. Seppala and some of his Siberian sled dogs were photographed in Bellingham's downtown area. The church in the background was the Swedish Baptist Church on Champion Street. This photograph was most likely taken November 9, 1926. Leonhard Seppala and his dogs received much attention and admiration, and had a full schedule during their time in Bellingham, according to the daily newspaper accounts. One stated in part: "Seppala's dogs were admired and petted by scores of adults and children.... Togo, the leader, would not permit strangers to pet him." Seppala and his dogs were scheduled to be filmed by Fox and Pathe News at the Heather Meadows area of Mt. Baker National Forest, which is located just east of Bellingham. Everyone showed up at the location for the shoot and a small amount of filming was actually done, but the event was canceled due to heavy rain. The news agencies tentatively rescheduled the rest of the project for the following spring. The famed musher and his dogs left Bellingham on November 12. Kansas City was the next scheduled stop for the tour which eventually took them to New York, New England and then on to a new chapter in the fame of Seppala's sled dogs. Neither Balto nor Togo would ever return to Nome, but Fritz would -- more than 70 years after his death in New York City on November 25, 1932. For Togo, arrangements had been made whereby he would be donated to the Yale Peabody Museum upon his death. Togo was put to sleep on December 5, 1929, by Dr. Carr W. Watson. 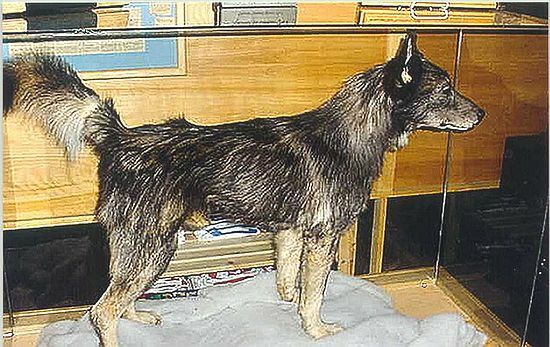 The body of this famous dog was taken to the Peabody Museum by Ralph Morrill, who later prepared his mount for display at the Dog Hall of Fame. To read the full story of "Togo's Final Journey," also by Lance Jensen, click here. Years later, Leonhard and Constance Seppala retired to Seattle, Washington. 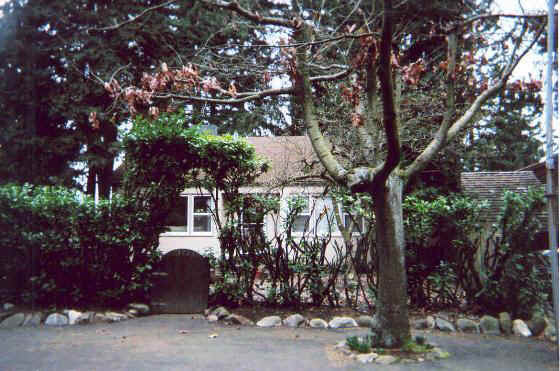 This photograph is of the house where they lived from 1951 to 1955. Mr. Seppala passed away in Seattle on January 29, 1967. In addition to the vacant lot photo, above, I found three other photos that were taken at Bellingham during the time period November 6 - 12, 1926. Two were of the Seppala dogs participating in a parade. It appears that all of the dogs brought to Bellingham were in these two parade photos. A rope was attached to the team and to the back of a car positioned in front of the team so that the dogs would follow the designated parade routes. I would like to thank Bob Thomas and Elsie Chadwick for their assistance in identifying some of the dogs in the parade photos. 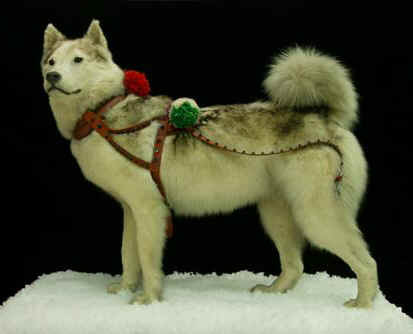 Siberians with definite identifications include Togo, Fritz and Matte. Possible identities of a couple other dogs include one white male as either Nurmi, Frosty or Paddy and another dog as Sugruk. One of the dogs at the rear of the vacant lot photo is possibly Chenuk. The third photo featured Leonhard Seppala and Togo. It was taken in connection with their participation in the Armistice Day events and parade on November 11th. I found three addresses for the Seppalas when they retired to Seattle. Two of the homes still exist. I also located and photographed the gravesites of Gunnar and Anna Kaasen. Gunnar's is at right.